Citation: Bidaki R, Yazdian P, Khalili Y, Vaghefi M, Teimoori S, et al. 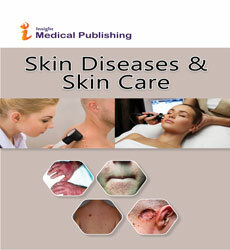 An Unusual Case of Suicide Attempt by Subcutaneous Injection of Gasoline.Skin Dis Skin Care. 2016, 1:1. Copyright: © 2016 Bidaki R, et al. This is an open-access article distributed under the terms of the Creative Commons Attribution License, which permits unrestricted use, distribution, and reproduction in any medium, provided the original author and source are credited. Most of gasoline-like compounds such as toluene, xylene, and butylene are toxic for people . Hydrocarbons are chemicals with different arrangements of carbon and hydrogen . Gasoline includes 500 hydrocarbons and other additives. Adults with suicide attempt and self-harm and children accidentally get intoxicated by gasoline . There are reports of gasoline intoxication by ingestion or inhalation in children, whereas subcutaneous or intravenous injection is rare . Normally, gasoline inhalation abuse is seen in patients with mental, neurological, cognitive disorder and psychomotor retardation . However, most of the intoxication is seen for people with occupational cases working in gas stations and gasoline reservoirs . The case was a17 year- old boy student who was admitted to hospital. He had a suicide attempt by subcutaneous selfinjection in forearm. He was transferred to hospital 72 hours after the injection. He had history of several suicide attempts by other means such as air injection into vein, touching electrical wires, cutting body and 3 times of pill consumption during past two years. He complained of severe forearm pain, fever and lethargy. In social and economic terms, he is from an average family. Based on history from his parents, suicide and aggressive behavior has initiated several years ago because of being humiliated by teachers and other friends. He has history of smoking, aggression, self-mutilation, sleep disorder, and serious changes in religious beliefs are some of his problems. While examination, he was lethargic, and had blood pressure of 60/90, respiratory rate of 12, heartbeat of 100and axillary temperature of 38.5. On examination of left hand, inflation was clearly visible from elbow to fingertips with severe erythema and tenderness, especially in the anterior region (posterior forearm near the left decubitus). Ulna had totally full, symmetric pulses, and capillary filling. Patient had mild leukocytosis, 13 × 109 per L WBC and Hb 10. Electrolytes, urea / Cr was normal. Blood culture and discharges from the site were negative. Supportive actions for the patient began such as: keeping the organ high, hydration, antibiotic as impiral with clindamycin and meropenem. Prior to surgery, counseling psychiatrist was requested which antisocial personality and cluster was diagnosed. Performed Doppler ultrasound on this patient in hipoecogen area in anterior forearm with accumulations was reported suggesting abscess. Surgical consultation recommended immediate surgery because of high risk of necrotizing fasciitis. At the beginning incision was done. 200ml of pus was drained. On the site of necrotizing fasciitis muscles brachialis and brachioradialis were evident. The debridement was performed. After surgery, patients received 2 doses of morphine (Figure 1). Figure 1: A. After debridement of brachialis and a part of brachioradialis muscle. B. 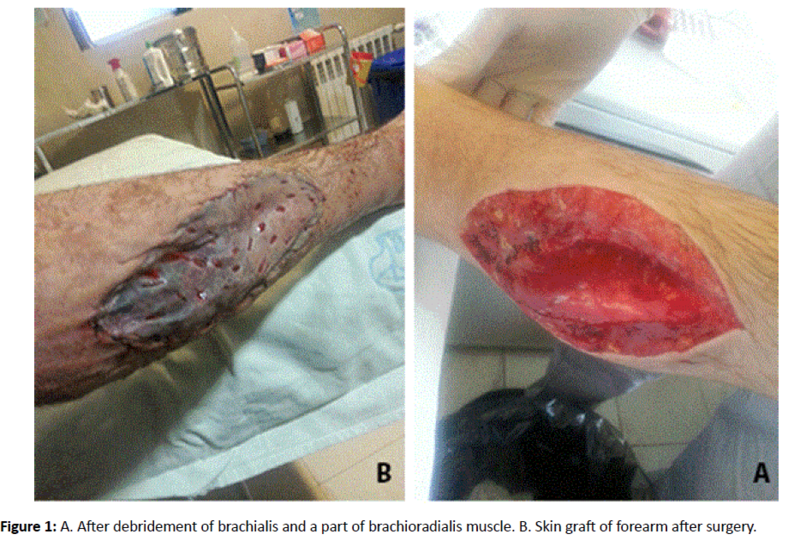 Skin graft of forearm after surgery. Antibiotics continued for 15 days, and the patient, who was under supervision during past month, had no problem from surgery and was under supervision of a psychiatrist, Citalopram 20 mg and Valproate sodium 200 mg and family therapy. Subcutaneous injections of hydrocarbons in previous studies were in adults, male and people with suicide attempt or injecting drug users or prisoners . This is a patient suicide with Hydrocarbons and large molecules contain lots of carbon and hydrogen atoms. These materials include gasoline, toluene, carbon tetrachloride, petrol, diesel, etc. In different reports, the injection material is mostly a blocker, cholinesterase with the hydrocarbon-based carrier . But in our patient oil was the injected material. In most reports, injection site was the anterior forearm, and due of lack of skill they had intramuscular and subcutaneous injection. In our patient, the injection site was in brachialis and brachioradialis muscles. Studies have shown that patient’s initial complaints are swelling, pain, and redness on the injection site. From systemic symptoms, fever, nausea, and vomiting can be noted. In most studies, like our case, polynuclear leukocytosis and electrolytes were normal but blood culture and discharges from the site were negative . In previous studies, most patients have not responded to supportive treatment. However, in most cases, different ranges of antibiotics have been used and been forced to surgery, such as fasciotomy or abscess drainage. For some, it was delayed in the first 48 hours, and debridement was performed after 4 days. For this patient, surgery was performed on 3 days after injection . Necrotizing fasciitis and compartment syndrome have been reported in several studies and that these effects were notobserved in our patient. Thrombophlebitis by intravenous injection have been reported in rare cases but not observed in our patient . In the treatment of patients with soft tissue hydrocarbon injection, patient should be hospitalized and adequate hydration should be done. The organ should be kept high and antibiotics should be started. In case of complications, surgery and debridement becomes the first priority . Neurologic symptoms of poisoning by oil include hallucinations, delusions, and nystagmus. These patients often are treated with haloperidol. Other systemic symptoms of poisoning by oil are ATN and interstitial nephritis that is usually temporary and treatable by fluid replacement and electrolyte management . Pinto FC, Chavantes MC, Fonoff ET, Teixeira MJ (2009) Treatment of colloid cysts of the third ventricle through neuroendoscopic Nd: YAG laser stereotaxis. Arquivos de neuro-psiquiatria 67: 1082-1087. An YZ, Pei YQ, Qin J, Zhao H, Li X (2015) Kinetic modeling of polycyclic aromatic hydrocarbons formation process for gasoline surrogate fuels. Energy Conversion and Management 100: 249-261. Mahmoodpoor A, Soleimanpour H, Hamishehkar H (2012) Multi organ failure following intravenous gasoline for suicide: a case report. Acta medica Iranica 50: 846-848. Fink K, Kuehnemund A, Schwab T, Geibel-Zehender A, Bley T, et al. (2010) Suicide attempt by intravenous injection of gasoline: a case report. The Journal of emergency medicine 39: 618-622. Yip L, Mashhood A, Naude S (2005) Low IQ and gasoline huffing: the perpetuation cycle. The American journal of psychiatry 162: 1020-1021. Tsivgoulis G, Heliopoulos I, Vadikolias K, Argyropoulou P, Piperidou C (2011) Ingestion of gasoline in a suicide attempt: an uncommon cause of bilateral basal ganglia T1 hyperintensities. Neurological sciences: official journal of the Italian Neurological Society and of the Italian Society of Clinical Neurophysiology 32: 739-740. Bindlish V (1993) Subcutaneous gasoline injection. The American journal of emergency medicine 11: 676-677. Domej W, Mitterhammer H, Stauber R, Kaufmann P, Smolle KH (2007) Successful outcome after intravenous gasoline injection. Journal of medical toxicology : official journal of the American College of Medical Toxicology 3: 173-177. Fow MI (1981) Gasoline exposure accidents. Bulletin (National Clearinghouse for Poison Control Centers (US)) 25: 20.